To inhale frankincense is to inhale tradition. The ancient resin, obtained from trees native to Southern Arabia, was used in biblical times for ritual, healing and as a perfume fixative. Modern herbalists use the essential oil obtained from the resin as a topical application. Additionally, many therapeutic benefits may be found simply from smelling frankincense through incense, candles, potpourri, a diffuser, bath blend or through steam inhalation. 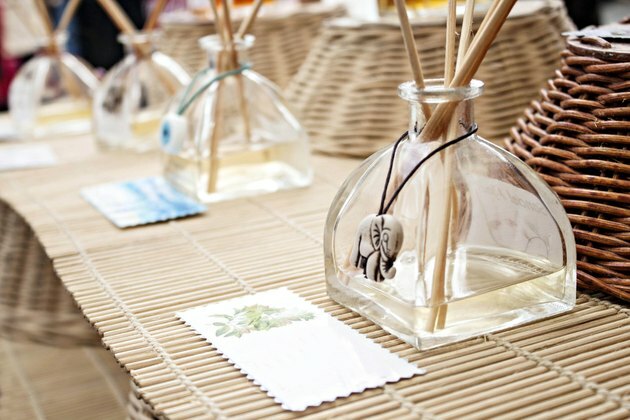 Adding frankincense oil to a steam tent may help ease sinus congestion and stuffy head colds, according to aromatherapist David Crow. Put up to six drops of the oil in a sink or bowl filled with very hot water, and bend over the sink with a towel draped over your head and the sink to contain the steam. Breathe in the vapors for at least five minutes, adding more hot water as needed. Peppermint also helps colds, while rosemary and eucalyptus aid clogged sinuses. Use the same steam inhalation method to treat bronchitis and similar respiratory ailments such as laryngitis. Consider replacing two or three drops of frankincense with eucalyptus oil for an especially therapeutic blend. As with colds and sinuses, frankincense is helpful because it helps regulate excessive mucus, according to Crow. Include frankincense in blends designed to promote calmness, deep breathing and relaxation. "For mental problems, for depression, for those who cannot get on with their lives, there is no substitute for frankincense," notes aromatherapy author Jeanne Rose. She recommends combining the oil with lavender, myrrh and balsam tolu in a diffuser or massage oil. Use the scent of frankincense as a sleep aid. A bath blend incorporating frankincense may be especially useful for those who wake soon after falling asleep, according to "Yoga Journal." Add two drops each frankincense, rose and ylang-ylang essential oils to a warm bath, and soak at least 20 minutes. Towel off gently and prepare for bed, perhaps after practicing a few minutes of deep-breathing exercises. The American Pregnancy Association suggests using aromatherapy in the various stages of labor. Purchase a portable diffuser and a few essential oils such as frankincense to bring with you to the hospital. Alternatively, burn incense or candles containing frankincense, or prepare massage oil containing the scent. Frankincense is especially useful for the periods of labor requiring deep breathing. It also soothes anxiety. Other scents that may prove helpful include clary sage and jasmine for contraction pain, lavender for pain relief and bergamot for relaxation.